Hi dear, I really like your sweater. 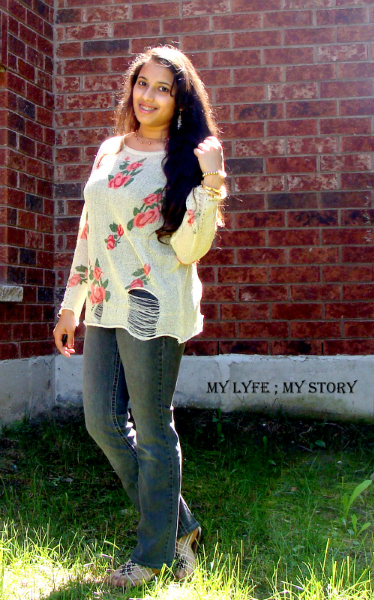 A very pretty floral sweater! Dreamy and stylish here, Harija. I love the entire look as a whole. Lovely hair and sweet smile. Amazing casual chic here. you have very interesting blog. Do you want to follow each other? gorgeous pictures babe! you look beautiful in floral! Amazing! you look like the perfect advertise for spring!!! Perfect spring layers here - love it from head to toe! I love everything about this look. Amazing. Going gaga over this outfit! It looks great! Wow this outfit is just gorgeous!!! The most adorable shoes ever. Awesome look. I love the pink top and the shoes. Oh my... I just LOVE those shoes ! I love the distressed look of your pullover. And I like the yellow dress and accessories you featured in this post as well. very cute laid back outfit! Love the floral top, such a pretty design. Very cool! I like the mix of floral and the rips!